Protesters in several Italian cities have clashed with police amid anti-austerity protests which have lasted for almost one week. The so-called “Pitchfork” protesters are marching against cuts and calling for the government to resign. 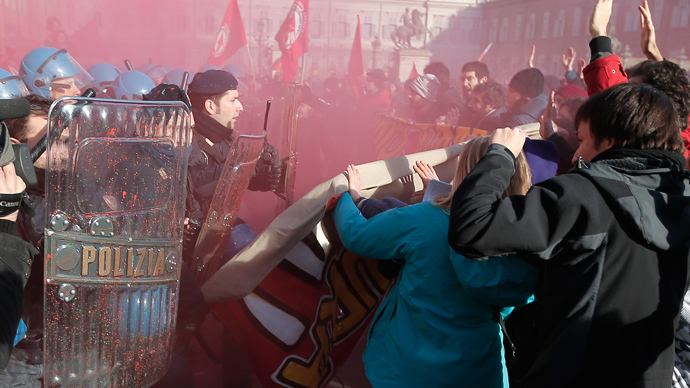 Demonstrators hit Rome, Venice, and Turin on Saturday. 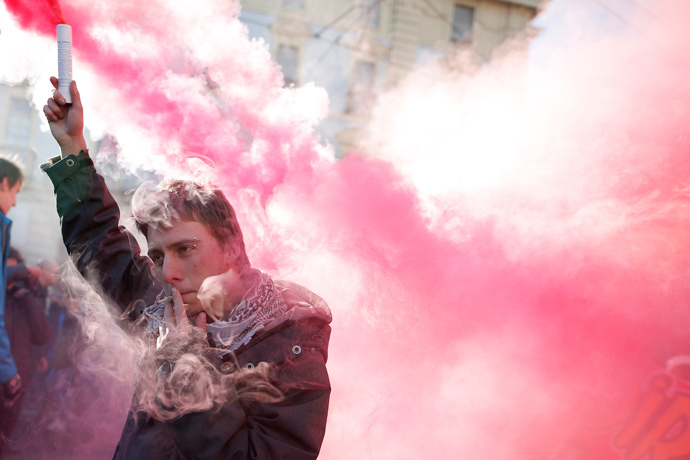 Students threw paint bombs at police in Turin, which has been the epicenter of the protests. The city has seen the largest number of clashes with law enforcement, with officers using tear gas to disperse demonstrators who hurled stones. Turin protesters also blocked rail traffic and stopped trains at the city’s main stations. Truckers - protesting high taxes and fuel prices - and students brought traffic to a virtual standstill earlier this week. Activists pitched tents on a bridge across a river bordering France, near the town of Ventimiglia, forcing police to step in. City authorities ordered reinforcement from security forces. Ten police officers were lightly injured during a Saturday rally in Venice, according to AFP. Security forces fired tear gas as far-right and far-left protesters demonstrated near a train station. Two people were detained. Far-right activists also rallied outside the European Commission's office in Rome. Wearing Italian flag masks and white nooses around their necks, they took down a European flag and were then chased off by local police. The rallies spread to the capital on Thursday, when hundreds of students clashed with police and threw firecrackers outside a university where government ministers were attending a conference. Activists have promised larger demonstrations in the capital next week. The protests are being staged in the name of the Forconi – or Pitchfork – movement, which was originally organized by a group of Sicilian farmers. "There are millions of us and we are growing by the hour. This government has to go," Reuters quoted one of the leaders of the protests, Danilo Calvani, as saying earlier this week. Lorry drivers, farmers, small business owners, students, and unemployed citizens are fighting against the government and austerity policies as Italy faces falling incomes, unemployment, tax hikes, and high prices. Unemployment has hit a record 41 percent for people below the age of 25 and is hovering at 12 percent for the rest of the population. Many of the protesters are condemning capitalism and the euro. As demonstrators blame the two-year recession on politicians, they are demanding that the government be replaced and parliament be dissolved. Fourteen policemen have been injured over the past several days. Many shops and other properties have been damaged. On Thursday, Interior Minister Angelino Alfano voiced concerns that the unrest could "lead to a spiral of rebellion against national and European institutions." He told lawmakers that although the government understood "the suffering of poor people," it would not allow the violence to continue. "We intend to defend the freedom of our citizens to live in safety and of our shopkeepers to do business," he said. Alfano said that the government has tried to talk with the protesters, but has thus far failed because there are many different groups and no clear leaders.